A week of LOVELY GIFTS! This week is supposed to be the most depressing week of the year…. Monday was apparently the worst day of the week…. making people feel low, and unwell and generally miserable (Who found this out and decided this was official enough to be newsworthy, I personally feel, is an idiot with too much time on his or her hands! hehe)……It, admitedly, was heavy and dark with rain in sunny Cambridge on Monday morning, so I could see why they say this….. …..I have been a VERY lucky girl this week, and having my dad return from his wordly travels safely last night, he brought home the token RANDOM gift……of……a Phillipino Broom! Amazing! And just typical of my dad to find this sort of *Gift* amusing….actually….it WAS quite amusing…..as we did joke that he had packed a little phillipino lady in his suitcase when he told us that my gift would help us in the kitchen hehe. 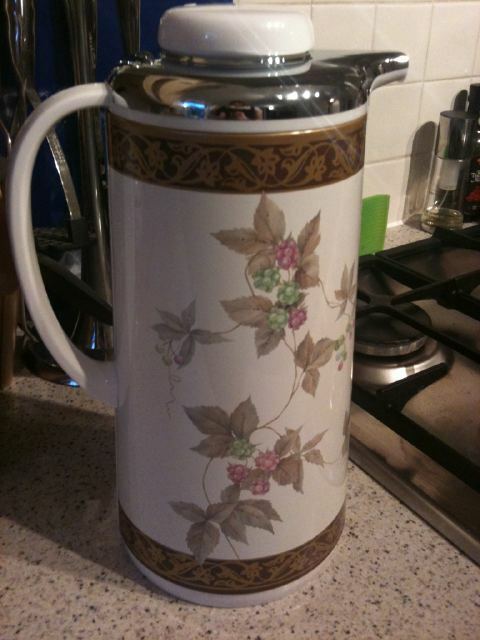 However, he did also produce a BEAUTIFULLY decorated thermos for storing my Tea in when I venture outside for Tea Parties Al Fresco in the summer! 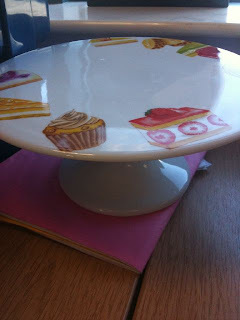 And today I have been blessed with a LOVELY new cakestand for The Secluded Tea Party table….from my lovely colleague at work. She had spotted this in a charity shop over the weekend, and thought of me…goodness knows why, as I force my kitchen experiments down her neck when I can hehe….Anyway, I love it! And it will be hosting some of my tasty home-made treats at The Secluded (New Year!) Tea Party on Sunday 30th January! – So watch this space for more pictures hehe! Love you Mrs (YOU know who you are ; ) !!! – Thank you so much!!!! I love your wonderful gifts! Join me for Tea Time on Tuesday.